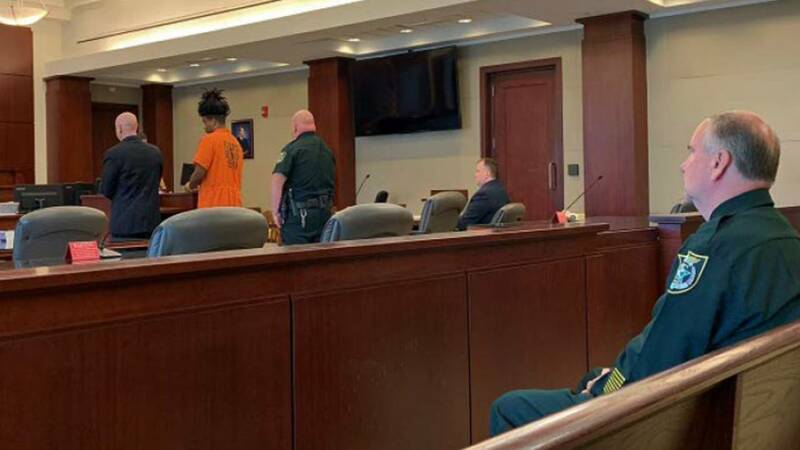 BUNNELL, Fla. - Sheriff Rick Staly was present in the courtroom Friday afternoon as Phillip Haire Jr., 21, accepted a plea deal that would send him to prison for 25 years on a charge of attempted second-degree murder of a law enforcement officer and other charges. Haire, 19 at the time, shot at his parents and Flagler County Sheriff's Office Cmdr. Phil Reynolds, who was a sergeant at the time, on May 1, 2017. Reynolds was at the home following up on a 911 report of threats at his parent’s house on London Drive in Palm Coast. No one was injured during the shooting but Haire fled and wrecked his vehicle. He then carjacked another vehicle at gunpoint. After a massive manhunt, Haire turned himself in the following day at the Putnam County Sheriff’s Office. He has been in custody ever since. In addition to attempted murder, Haire pleaded guilty to aggravated assault on a law enforcement officer, two counts of aggravated assault with a deadly weapon, carjacking with a firearm, and burglary with a firearm. "It is extremely troubling that the defendant assaulted not only law enforcement, but his mother and father as well," State Attorney R.J. Larizza said. "We should never forget the dangerous nature of the law enforcement profession and the deadly nature of domestic disputes. I hope the defendant will reflect on his actions while incarcerated in the Florida state prison system."